Join us as we explore the various systems of martial arts, beginning with the Chinese systems. Illusive Pugillism, or Western Tai Chi Ch’uan, is the physically-deceptive manipulation of an opponent’s sense of offense and defense to the point of ineffectiveness. It uses grappling and striking to neutralize the offense of an opponent while fluidly striking and grappling through an opponent’s defense without serious injury. Illusive Pugilism integrates the 13 postures of Tai Chi Ch’uan into the competitive, combative disciplines of Western boxing, kickboxing, and grappling. Meet Sifu Lew, the first to openly teach the internal cultivation (chi gung) to non-Chinese in the United States. 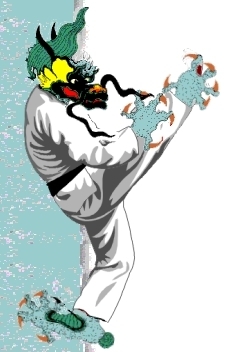 Kung Fu San Soo is a fighting system based on biological and physical principles that were researched and developed over a period of of more than 2,000 years. Dragon Style Kung Fu is famous for its handwork. The heart of the system is a set called mor kiu or "magical arms." We continue our exploration of the fascinating styles of martial arts, this time focusing on martial arts in the movies and television. Aikido is stimulating physically, mentally, and spiritually, and it is definitely a great workout. The most beneficial health gains offered from the martial arts come in the form of chi development. True health comes from a harmonious union of mind and body. Proper board-breaking practice increases self-defense skills, as well as concentration, confidence, and discipline. Originating in 8th century A.D. in the Philippines, Arnis De Mano is still practiced worldwide - over a thousand years later. Wing Chun has become one of the most popular and sought after Kung Fu systems in the world today. Grandma had told me, “No matter where you go or what you do, no matter how far you ride that horse, you will always be you. You are wonderful and I love you just the way you are.” Later I traveled to Taiwan and China, only to get the same message from Shaolin monks.